Polar have spent the last 10 years being one of the UK’s hardest working bands. Now head of the release of their fourth album Nova, we caught up with Adam “Woody” Woodford, Tom Green, Jonny Bowman and Fabian “Fab” Lomas. 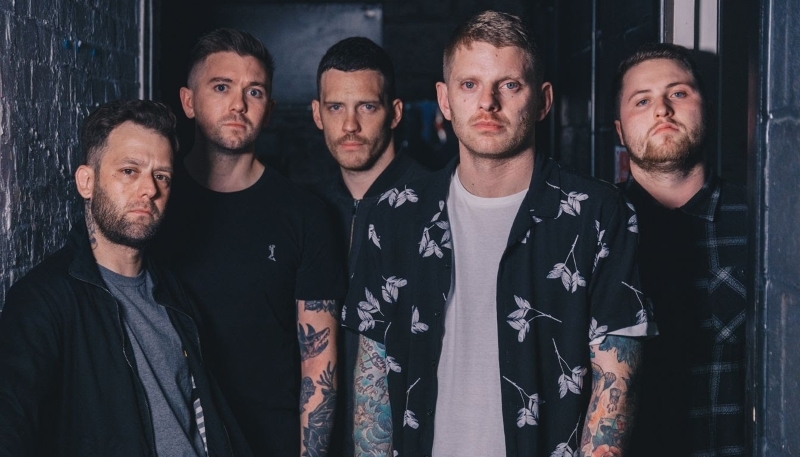 With their new album on the horizon there was plenty to catch up on as well as looking back on how far the band have come since they formed in 2009. So you’ve released a couple of singles off the album now, do you think these have given fans a good taste of what to expect from Nova? Woody (vocals): I think so yeah, they’ve all got little elements of what the whole album is gonna sound like. They were definitely the strongest choices. Obviously Breathe we released a long time ago. Tom (guitar): It was the first song we wrote for this album, sort of set the tone of where we were heading. Jonny (Bass): And then Drive and Midnight have the hints of what’s to come as well. And have people been responding to these songs well? Woody: So far yeah we’ve had a really good reception to all the songs. So was Breathe written as a stand alone song originally and then included on the album when you wrote the rest of it. Tom: So we wrote four of the songs initially and Breathe was the one we decided to take further. We did go into the studio earlier to do that one in particular whilst we were still finding our feet with the rest of the material. But Breathe did just immediately jump out at us as being the one to represent us going forward. We knew we wanted something out earlier. And then like Jonny said those other songs encompass the journey. So what is it that really separates Nova from the previous Polar albums? Woody: For starters lyrically it is a much more personal record. More than anything we’ve done in the past. Being the singer I don’t know huge amounts about it but the guitar tuning has changed, which has allowed us to go heavier. And we are now looking to create more soundscapes. There are huge elements of electonics throughout the record. It’s much more dynamic, we weren’t scared to bring things down a bit. We’ve used Fab’s clean vocals a little bit more to create a greater vocal dynamic throughout the record. It’s not just that one tone of screaming from me. I think as a whole it’s just much a much more evolved sound. Tom: We’re much more comfortable with this writing team. Polar have had a different line up for every album whereas this is our second album all together. It’s allowed us to be both more refined, we know what we can do and can do it better. But also we are more willing to expand. I feel like with this album, it’s more expansive than the others but it is also more focused. Jonny: We’ve made a point of not being scared to try things. Even if someone had an idea and it was more out there we thought let’s try it anyway and see how it goes. Tom: Which also might not be all that apparent right now as the songs we’ve released, only represent a certain amount of the album but there’s some moments here that people won’t expect. The closing track is the one that really stood out to me on the first listen. So you said the album has a more dynamic sound, do you think that is the defining characteristic of this album? Essentially you just wanted to be the best you can with this. Tom: Yeah, egos got bruised, ideas got trashed but that’s how you come out with good art. Jonny: There’s always gonna be some arguments and differences of opinions but at the end of the day, as Tom said it’s all for betterment of the songs. Tom: Just think of Hot Fuzz, “for the greater good”. It good heated but it was all very passionate. Jonny: We all left the studio and still wanted to have a beer and hang out, it’s all good. So you said before about there being a lot more electronics on the album, was this something you really wanted to push from the very start with this album or did it just come naturally over time. Jonny: It kinda started a little bit on the last album but we just wanted to push it a step further this time. Tom: When I joined just before the last album, everything was written and performed live in the room. Anything else was added in the studio afterwards. But when I joined I brought in a certain amount of technology to the band, we started demoing stuff more on a computer and then before you know it you’ve got a keyboard in and we could do more, it sort of seeped in from there. We did a bit more on the last album like Jonny said but with this album, some of our favourite bands have all these electronic elements. Jonny: That 80’s synth thing has really been coming back and that’s what we’ve been listening to a lot more generally. We were thinking what if we just try throwing a bit of that in and just trying some different stuff. Woody: Having that extra dynamic allows us to do the peaks and troughs, adding that that electronic value into the music we can drop the guitars. It allows the songs to Breathe… excuse the pun. But it made us to let the listener really digest what’s going on in the music. Drive definitely has that clear 80’s synth influence. So you said about how you started to add in these elements a bit on the last album, that album felt like a bit of a departure from Shadowed By Vultures. Did it feel more like you were building upon the previous album this time then? Jonny: As Tom mentioned, the last album was the first one with Polar as you know it now. So there was always going to be an element of everyone finding their feet within the dynamic of the band. Whereas now we’re a lot more comfortable. Tom: I wasn’t disappointed with No Cure, No Saviour but by the time the dust had settled and the songs were out there were so many moments where I was like “why did we do it like that” or “why didn’t we change this up”. I was just constantly questioning it and this album is just growth as five people and we’ve just really found our feet. In a lot of ways the writing process was more streamlined this time. Despite all the added electronics, you certainly haven’t lost any of the intensity or heaviness, I mean you mentioned having a heavier tuning for the guitars earlier. Did you find it difficult to get this balance? Woody: It all kinda feel into place and worked well. The electronics just complimented the heavy stuff. We were consciously trying to go heavier as well. Tom: We discuss our music a lot, like after a writing session we’d sit around for two hours talking about it. It got to a point where every single time someone would say this bit could be more melodic or we wanna introduce this element. But then there’d be someone on the other side saying we’ve lost the intensity of this piece now. Constant pushing from both ends an it all sort of met in the middle to create this album. We did still want it to be heavy cos we just love heavy music. It’s like with the choruses on this album, you don’t just started singing. It’s still all done with that harsher vocal, you just make it sound bigger. And that helps you keep the heaviness on the album. You haven’t compromised on being heavy, the scope of what you’re doing is just far bigger. Woody: We looked at vocal pitching and the way I use my voice. And we’re also using more voices, we’re a multi layered band vocally. That helps elevate the sound we’ve created on Nova. It’s interesting for me as it gives me something to aim towards by evolving my voice. If you look at guys like Oli Sykes and Sam Carter they are constantly changing their voice, they’ve still got that original sound in there but they’ve just evolved it. That’s what I’ve aimed to do with myself on this album. If you listen to Iron Lungs and then what I’m doing now it’s totally different. Tom: It’s never about being poppier for us, it’s just about being more memorable. If it’s about being memorable and not just lets gloss this up and make it poppy, it’s still gonna sound like Polar. It’s still gonna be raw and heavy but we just want something else for people to remember it by. That’s how we’ve reached the point we’re at now. The singles have got some pretty memorable hooks on them anyway, like the “I’ll follow you into the dark” bit on midnight. So with the layered vocals, alongside Fab doing the backing vocals there’s also more female vocals used throughout the album and layered in. Woody: Yeah Ellie Price is back, she’s like the sixth member. What challenged me this time when we started recording was that Ellie would sing the choruses before I did. So she’d put the pitches in place and then I’d have to go in and ruin that. But it helped me get these choruses down, being able to hear it sung and then mimic that screaming. Jonny: With our producer and her, we have other people close to this band who mould us and help us. Every day is a school day for us, we’re constantly learning and they help us reach our ideas of what we want with these choruses. All of us together just helped it along the way. All these elements do just come together to make this album way bigger than anything you’ve done before. Woody: We wanna be as big as we possibly can be. For us it’s been 10 years in this industry now, we’ve got older as people and I think our music has to display that sense of maturity. That’s something we were conscious about when we went in to do Nova. Making our music sound like we are at the age we are. We’re not angst ridden teenagers anymore, as much as we’d like to be but we can’t write that sort of music. We’re not angry at our parents anymore. If anything we’re quite happy to see them at this age. But you’ve gotta show maturity in your sound as you get older and I think that’s what we’ve really tried to do this time. Show that maturity, whether it’s through the production of the music itself. Tom: None of us like to be limited. We don’t want to told we have to be a certain genre or this isn’t right for this type of music. We here it all the time from a lot of people and I can’t stand the thought of being told you can’t do something. We do what we wanna do and right now that ended up being Nova. And perhaps the next album will be even more expansive, maybe it will be less who knows. But the idea of being told you can’t do something because of whatever reason didn’t do it for us. Genre boundaries are becoming less rigid now anyway, you’ll always get someone who pushes back but generally fans seem more open now to bands going out there comfort zone. So with this being the longest gap between albums was it quite a difficult process or did you just want to take your time with it? Woody: We just took a step back. For so long it was just album, tour, album, tour and when we got to the end of the No Cure cycle it felt like the right time to step back from the touring side and just concentrate on the music. Invest all our energy and time into writing and not just doing something quickly before rushing off on tour. So that investment allowed us to develop our sound more. I think it’s important for bands to disappear for a little bit just to help create more interest. When you come back with a new product it’s important for the listeners to here what you’r doing and how you’r improving. Fab: A lot of us went through a lot of stuff too. At the end of the day we’re all humans and as much as this band means a lot of us, we have relationships and family and friendships at home that sometimes need addressing. Sometimes we’ll spend like half the year away from home and sometimes you need to just take a step back and take stock of what you’re doing. Sort some things out and make sure you are ready for what comes next. So yeah we just needed a bit of time off. Was this something that contributed to the album being more personal this time then? Jonny: It was the key inspiration lyrically. We wanted this album to be from the heart, also personal and real things to us. Some lyrics got thrown away cos they weren’t close enough to us. Fab (guitar): The previous album was really the opposite. It was all inspired by stuff we’d witnessed in the outside world. Stuff we saw that we don’t agree with or stuff that aggrieved us. This is much more us. Woody: I think we needed that release. It got to a point where for lot of us things were tough. Life does push you to the limit sometimes and I think when you’ve got the ability to put it into context and actually have that release, we’d never really explored that. And it’s harder to do, because you have to be so critical. When you’re writing something that is very personal and everyone else is hearing it and they’ll all have an opinion on it. It’s hard cos you’re kind reliving that moment. But I think that’s made us a much better band lyrically and vocally. Fab: It just makes for a more genuine message in the songs. It gives the listener something to latch onto. Tom: Every word on this album is real, I know sometimes things get said in songs to provoke a reaction but this is straight up real things that we’ve felt. So you’ve got a headline tour lined up just after the released of the album. It’s been a while since you’ve gone out headlining so are you excited to get back on the road. Tom: We love supporting bands and getting to play to a wider audience but in the end we like to have a special connection with our fans and you get that best at headline shows. When everything is on your terms and you can portray everything about the band in your way. That’s really important to us. Woody: It’s nice to be able to play more songs too. You’re very capped when supporting. You get a small window and within that you’ve gotta think what’s best for the crowd. What’s gonna win people over and grab their attention. And then what songs do your fans who are there wanna hear. Doing a headliner you’ve got a much bigger slot to allow you to play more songs. When you finish the set you’re less likely to have someone disappointed you didn’t play a certain song. You can really please your audience. Jonny: There’s a greater sense of accomplishment when you come off too. We’ve been very lucky where most of our recent headline experiences have been amazing. When you come off after a headline show it really does mean something more. With the new material, cos there is a lot more going on do you think it’s gonna be hard to make this translate live? Tom: They’re harder to play. Woody: I think it’s good though. We’ve played Drive, Midnight and Breathe before now and you notice these songs just feel bigger alongside some of the older songs. Yeah they are harder to play but that’s also making them sound better. Tom: The challenge of these songs is making us better. Fab: Also the content of them being more personal makes the performance is a lot more emotional. You can really feel yourself getting caught up in it and it makes the performance more genuine. So lastly, you mentioned before about this being the bands tenth year since they started. Did you ever expect to be at where you are now? Woody: Ahahaha for a band that got together to do one tour I think we’ve done pretty well. I guess when you’re in a band you always wanna be in the situation where you’re playing arenas or something crazy like that. Like wanting to evolve into this massive band. But I think over the 10 years we’ve accomplished a lot. There’s been plenty of highs and lows but everything we’ve done, we’ve accomplished with a fair amount of success. We’re still here 10 years later, still on the road and still releasing albums. That in itself is a huge accomplishment. Tom: Like I wasn’t in Polar when it started, but Heights was a similar situation. We got in two beaten up cars and just went on tour just so we could see what Glasgow was like. I had no idea that we’d be doing this 10 years later. It’s been a ridiculous journey. Fab: And you never know how long it could last. It could have just been a year, it could last another 10 years. But I think what’s important is that whilst you are here, you make it count. Great, well thanks so much guys and best of luck with the album release. Woody: Thanks so much, always good to see you. 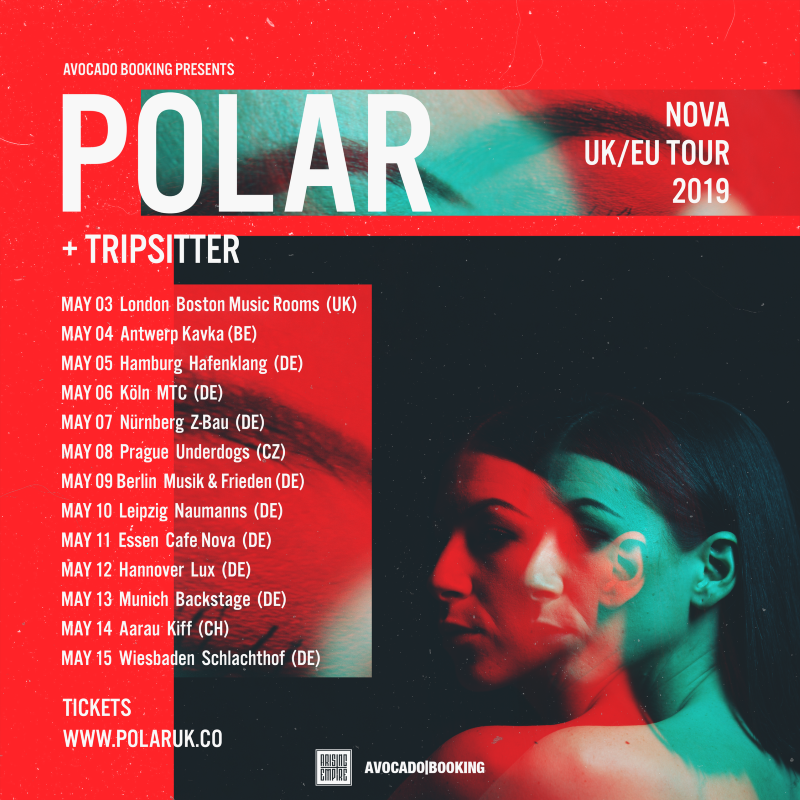 Polar’s brand new album Nova is released tomorrow, April 5th 2019, on Arising Empire Records. They will celebrate the release with a European tour, the opening night of which is in London at The Boston Music Room on the 3rd of May.